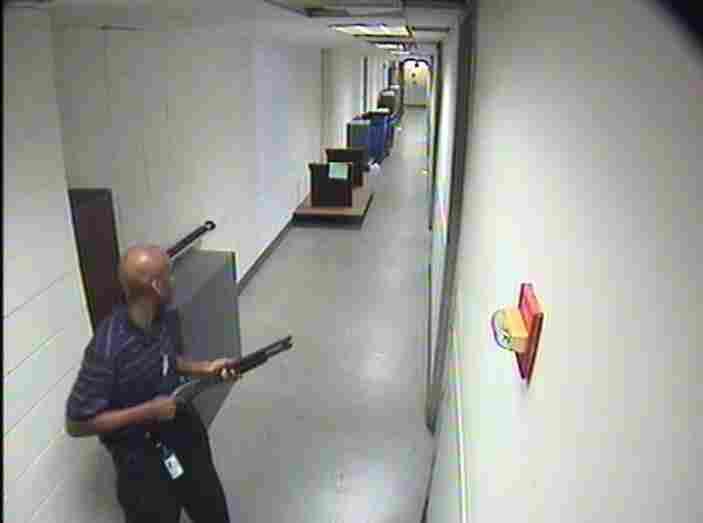 FBI Releases Video Of Navy Yard Shooter Moving Through Building : The Two-Way The FBI released its preliminary findings in its investigation of the Navy Yard shootings that left 13 people dead including the shooter. Aaron Alexis said he committed the massacre because he was being attacked by electromagnetic waves. Alexis moves through the hallways of Building #197 carrying the Remington 870 shotgun. The FBI on Wednesday released some preliminary findings in its investigation of the Washington Navy Yard shootings that left 13 people dead including the shooter. Also of note: investigators found "electronic media" in a backpack Alexis left inside a bathroom at the Navy Yard. The FBI is still analyzing the documents, Parlave said, but there are clues Alexis was motivated by a belief that he was being attacked by electromagnetic waves. "ELF technology was a legitimate program for naval sub-tonal submarine communications; however, conspiracy theories exist which misinterpret its application as the weaponization of remote neural frequencies for government monitoring and manipulation of unsuspecting citizens." The FBI also said that Alexis' shotgun was etched with several phrases: "End to the torment!" and "Not what yall say!" and "Better off this way!" and "My ELF weapon." 7:53 a.m. - Alexis' rental car, a blue Toyota Prius with New York plates, entered Parking Garage #28 at the Washington Navy Yard, located directly across from Building #197. 8:09 a.m. - Alexis exited the elevator on the fourth floor and entered the men's bathroom carrying a backpack and a clipboard. During the press conference, Parlave said that there is no indication at this point that any of the victims were killed by friendly fire. Parlave also said that Alexis did not give anyone any hint that this attack was imminent.